The second trailer for Illumination's The Secret Life of Pets 2 puts the focus on Chloe the cat. In the new footage, Chloe tries to wake up her owner to get some breakfast. She does the usual cat move of jumping on the bed and staring, before letting out some gentle meowing, which later turns into a full screech, but her owner doesn't budge. Chloe steps things up a notch by preparing the good old fashioned hairball technique, which automatically gets her owner's attention as Chloe lets the hairball out on the bed. 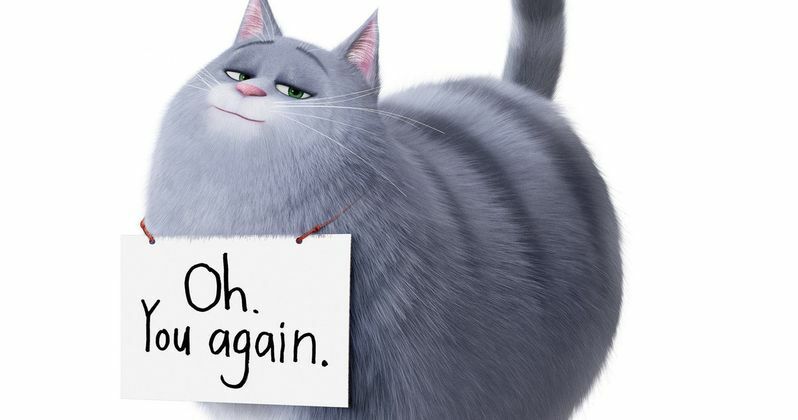 Many cat owners can relate to the first half of The Secret Life of Pets 2 trailer. While cats are fiercely independent, they can demand attention to get fed whenever they feel like it. The second part of the trailer is when things get a little bit more interesting as we see the effects of catnip on Chloe. She starts to trip out and discovers that she has some pretty interesting talents that she never knew that she had. All in all, the second trailer for the sequel is another homerun, and a perfect way to start the promotional campaign. A few weeks back, we were treated to the first trailer for The Secret Life of Pets 2, which introduced us to Patton Oswalt's version of Max on a trip to the vet. All of the animals, except for Max seem to be having a panic attack about being at the vet, going through different stages of freaking out. Oswalt took over the voicing duties after comedian Louis C.K. was fired from the sequel. In addition to Patton Oswalt, The Secret Life of Pets 2 also stars Eric Stonestreet, Kevin Hart, Lake Bell, Dana Carvey, Jenny Slate, Albert Brooks, and Hannibal Buress, who are all reprising their roles from the first movie. Harrison Ford will voice a new character. The first installment was a success at the box office, generating over $875 million globally, which pretty much guaranteed that a sequel was going to be made. Though this the Chloe trailer is the second to be released for the sequel, we're still not sure what the story is going to focus on this time around. The Secret Life of Pets 2 hits theaters on June 7th, 2019. Leading up to that, Illumination is going to keep releasing the character trailers to prepare everybody for the sequel, so there's a lot to look forward to in the coming months. The Max trailer is currently playing in front of The Grinch, which scored a number one debut at the box office last weekend and held strong at number two this past weekend. As with most things that Illumination does, it looks like The Secret Life of Pets 2 will be another big hit for the studio. You can watch the Chloe trailer below, provided by the Illumination YouTube channel.